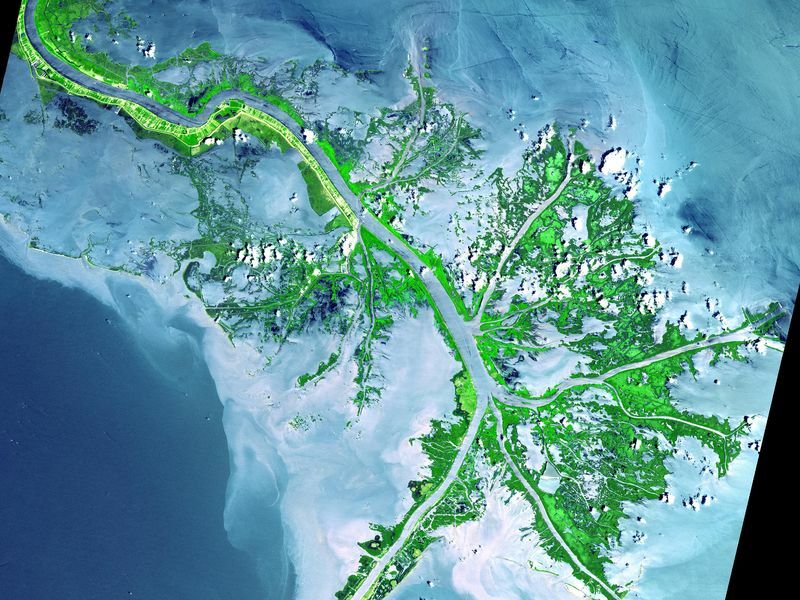 As the Mississippi River enters the Gulf of Mexico, it loses energy and dumps its load of sediment that it has carried on its journey through the mid continent. This pile of sediment, or mud, accumulates over the years building up the delta front. As one part of the delta becomes clogged with sediment, the delta front will migrate in search of new areas to grow. The area shown on this image is the currently active delta front of the Mississippi. The migratory nature of the delta forms natural traps for oil. 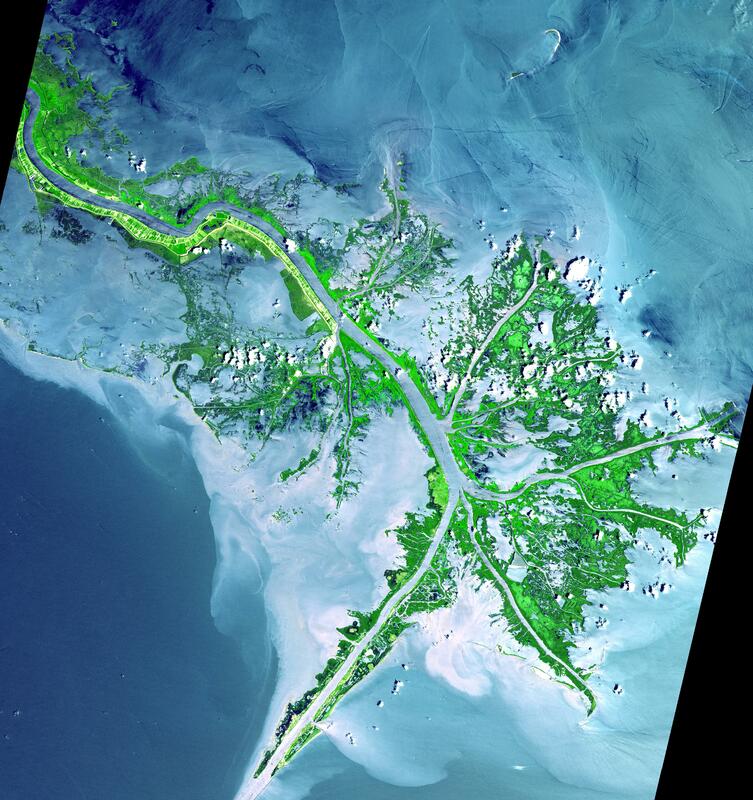 Most of the land in the image consists of mud flats and marsh lands. There is little human settlement in this area due to the instability of the sediments. The main shipping channel of the Mississippi River is the broad stripe running northwest to southeast. This image was acquired on May 24, 2001 by the Advanced Spaceborne Thermal Emission and Reflection Radiometer (ASTER) on NASA's Terra satellite. With its 14 spectral bands from the visible to the thermal infrared wavelength region, and its high spatial resolution of 15 to 90 meters (about 50 to 300 feet), ASTER will image Earth for the next 6 years to map and monitor the changing surface of our planet. 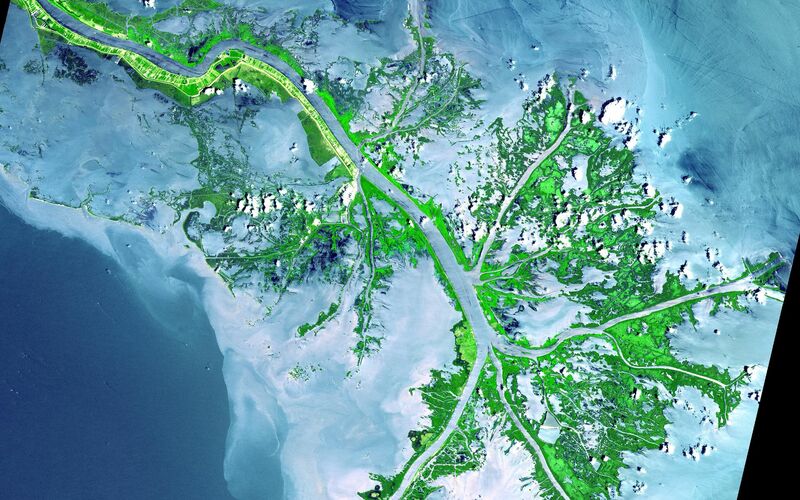 ASTER is one of five Earth-observing instruments launched December 18,1999, on NASA's Terra satellite. The instrument was built by Japan's Ministry of Economy, Trade and Industry. A joint U.S./Japan science team is responsible for validation and calibration of the instrument and the data products. Dr. Anne Kahle at NASA's Jet Propulsion Laboratory, Pasadena, California, is the U.S. Science team leader; Bjorn Eng of JPL is the project manager. The Terra mission is part of NASA's Earth Science Enterprise, a long-term research and technology program designed to examine Earth's land, oceans, atmosphere, ice and life as a total integrated system.